1. Contact the Civic Society to see what projects we might facilitate (currently I have emailed and phoned their chairman (Jeff Stubbs) but have yet to make contact!) e.g. tree planting, wild flower areas, the RHS Green Streets Campaign. 2. Liaise with Cheshire Wildlife Trust regarding potential projects (emailed but no reply yet). 3. Liaise with Nantwich Town Council regarding potential projects e.g. replacing blue plaques, planting (emailed Town Clerk, Ian Hope, but again no reply). 4. 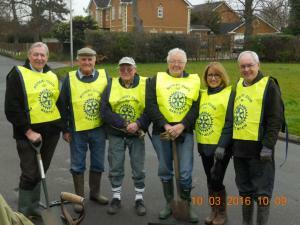 Promotion of Rotary Spring Clean (in conjunction with the local litter picking group). 5. Himalayan Balsam Bashing sessions (in conjunction with Cheshire Wildlife Trust). 6. Any other sustainability issues that might arise.